According to Hogg and Weeks, in their book Pistols of the World, the Robar company began life as Robar & de Kerkhove, which manufactured low-cost pocket revolvers in the 1890’s. However, according to John Walter, in his Dictionary of Guns and Gunmakers, a company by the name of Manufacture Liégeoise d’Armes à Feu, Robar & Companie, S.A. already had a London office in the period 1882-1884. In any case, it was the latter company, known in short as Robar et Cie. that manufactured pistols under the name Melior. 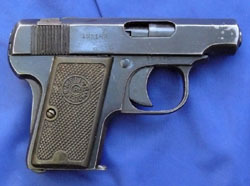 Their first auto pistol appeared in 1907 and was updated in 1911. 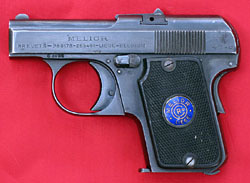 After the appearance of the New Model around 1920 the older gun became known retroactively as the Old Model Melior. The design of the New Model is derivative in many of its individual parts, though unique as a whole, and may be of interest to some as a brief chapter in the history of self-loading pistols. My friend Earl Mount has loaned me two guns from his collection which, judging by their serial numbers, are an early and a late version. I also have photographs of guns from the collection of another friend, Stefan Klein. There may be other versions which I have not examined. I have assigned type numbers to the various specimens I have catalogued, based on serial numbers, but I cannot be certain they are in the correct order. Indeed, Matthews, in his book Firearms Identification, Vol. I, indicates that it was the later version of the gun that lacks the grip safety, rather than the early version. But the gun I have examined with the lowest serial number is the one lacking the grip safety. The first distinctive feature of the New Model Melior pistol is related to the fact that the breech block is a separate unit from the slide, and the joining of the two holds the slide on the frame. This separate breech block was copied from the Model 1900 FN Browning and was also replicated in the Old Model Melior. However, the Browning’s breech block is attached to the slide by two screws, and dismantling the gun requires removing these screws; whereas the New Model Melior’s breech block is held in the slide by a dovetailed transverse locking piece fixed to the slide by a spring-loaded lever which also serves as the rear sight. Dismantling the Melior simply requires one to lift the lever and push the locking piece out the side of the slide. To my knowledge, no other gun has this unusual take-down method. The breech block incorporates the firing pin, firing pin spring, cocking indicator, and extractor. The second distinctive feature of the New Model Melior is a captive recoil spring. A bushing at the rear of the spring abuts a cut in the interior of the slide to hold the rear of the spring in place, while a screw-in bushing in the front of the slide retains the front of the spring. The rear bushing also serves to cover the recoil spring in the ejection port and so prevent dirt and grit from getting caught in it--this rear bushing is similar to that on the Walther Model 2, Model 3, Model 4, Model 5, and Model 7. The Melior shares the full slide and concentric recoil spring seen in these Walthers, but the front bushing on the Walther serves as its means of disassembly. The unusual piston-shaped sear of the Melior, which moves in a cylinder in the frame, can be traced back to the Walther Model 1. The lockwork of the Melior is on the right side of the gun instead of the left, as on the Walther. There is an L-shaped sear lever, similar to the Walther’s, that pivots on a pin staked to the frame to lower the sear when the trigger is pulled. Like the Walther, the Melior uses a spring-loaded striker rather than a hammer. The connector bar on the Melior runs on the right side from the trigger to the sear lever. The disconnector projects upward at a right angle from the connector bar, as on many of the Spanish copies of the 1903 Browning. The spring-loaded manual safety on the Melior is just behind and above the trigger on the left side of the gun. It appears to be identical in function to those on the Spanish copies of the 1903 Browning referred to above--it locks the trigger and prevents it from transmitting motion to the sear, but does not lock the sear itself. There is no grip safety and no magazine safety on the Type I.
I have attempted to locate the patents, but a search of the European Patent Office did not produce any results. The serial number is stamped on the right side of the frame above and slightly in front of the trigger, as well as on the right side of the slide behind the ejection port; it is also stamped on the breech block and many of the small parts of the gun. The serial number of the gun examined is 4694. The usual Belgian proof marks are stamped on the left side of the frame just above the trigger, as well as on the front of the barrel and the top of the breech block. On the left side of the frame, just above the bow of the trigger guard is the caliber designation, 6.35 BR, for 6.35mm Browning. The grips are made of horn, checkered, with an annulus centered toward the top containing the words “Melior” and “Liege” surrounding an “RoC” Monogram in the center. The left grip has a screw at the top and one at the bottom, whereas the right grip has screws at the center rear and at the bottom. The magazine is nickeled, unmarked, has a flat follower, and has 5 holes drilled through each side for viewing the cartridges. The production quality on the gun examined here is not the highest. Faint milling marks are visible on the surface of the frame, and heavy marks are visible on the inside of the grip. I have been unable to examine a Type II in person, and unfortunately the photographs I have are not good enough to give a complete description of the gun. The two guns I have noted of this type are serial numbers 62983 and 89630. I’m referring to this gun as the Type II, but there could easily be other types or variants not described here. The most obvious difference between the Type I and Type II is that the Type II has a grip safety. The captive recoil spring is retained, as is the transverse locking piece that links the breech block and the slide and holds the gun together. The breech block continues to be a separate piece which can be removed from the slide. The right side of the grip is not cut all the way to the top of the frame as in the Type I and Type III--hence the grip plates do not extend all the way to the bottom of the slide. I assume that the grips continue to be made of horn. They feature the word MELIOR in a curved oval at the top, beneath which is a TR (or possibly RT) monogram in a circle. The connector or transfer bar that links the trigger to the sear runs on the right side of the gun. It has a transverse pin at its rear end which moves the sear and releases the striker. The disconnector rises up behind the sear, internally, on the right side of the frame--when the slide is out of battery the disconnector is pressed down and moves the connector bar down so it cannot engage the sear. The next gun I have to examine is serial number 125182, so it is later than the other guns described, if we assume a continuous series of numbers. I’m referring to this gun as the Type III, but there could easily be other models between these types. 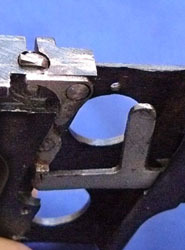 The Type III retains the separate breech block of the earlier pistosl, but the spring-loaded lever on the dovetailed locking piece no longer serves as the rear sight. Instead there are two raised ridges just in front of the locking piece which are nearly invisible when viewed from behind and hence virtually useless. The captive recoil spring has been retained with no changes. The contour of the rear of the slide has been modified slightly, and the lower edges of the slide are flat instead of machined at an angle. The design of the breech block has been modified so that the firing pin and firing pin spring are not retained but can slide out the rear of the block. A finger of metal rises up from the rear of the frame to form a backstop for the spring guide, which has a U-shaped end piece which fits over this metal finger. Only the last two digits of the serial number are stamped on the breech block. The piston-shaped sear has been eliminated in favor of a browning-style pivoting sear. A small lever has been added near the top of the magazine well to serve as a magazine safety--this lever blocks the sear until the magazine is almost fully inserted. The gun also features a grip safety which blocks the sear when not depressed. Altogether, this is a more sophisticated and safer pistol than its predecessor. The quality of the machining is much higher than on the earlier gun, with no machine marks visible on the exterior. The interior of the frame is much cleaner as well. The slide inscription on the left side is the same as on the earlier gun, but the word “Melior” is now in sans-serif characters. 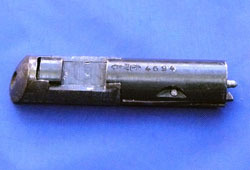 Belgian proof marks are evident on the slide, frame, and barrel. On the left side of the frame, just above the bow of the trigger guard is the caliber designation, CAL 25. Most small parts are stamped with the last two digits of the serial number. The grips are the same as on the early model, but the right grip is retained by a single screw at the center rear instead of two screws. The magazine is identical to the earlier gun, except it is blued instead of nickeled. The final gun I have to examine is represented by serial numbers 8255, 13077, and 22020. I believe, as did Matthews, that the Type IV is numbered in a different series from the other guns. I’m calling this gun the Type IV for lack of a better designation. I find no such designation in old catalogues, where all the Melior guns are referred to as the Melior 6.35mm, and either the length of the gun is specified as the distinguishing feature of the different sizes or scaled pictures of the guns are provided. 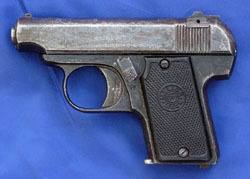 The Type IV was clearly patterned after the Walther Model 9, which took the vest pocket pistol market by storm when it appeared in 1921. All the world’s major pistol manufacturers wanted a product that could compete with the Walther. 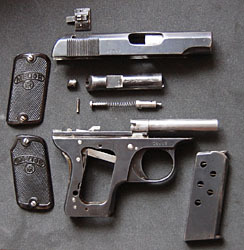 The Type IV retains the separate breech block and slide held together by a transverse locking piece, but in the case of the new small pistol the locking piece is moved considerably forward on the slide and the spring-loaded locking lever is reversed so that it points forward and also serves as a top-mounted extractor. 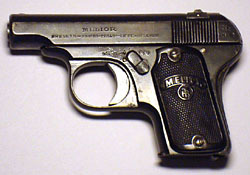 Like the Walther, the Type IV Melior has an external connector which runs beneath the grip plate on the right side. An integral disconnector projects upward from the connector at right angles. Also like the Walther, the recoil spring has been moved to beneath the barrel. The Melior has an ejector on the left side made from very thin sheet metal, which is easily broken off. 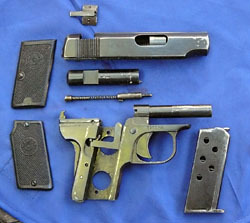 Both the Walther Model 9 and the Type IV Melior have top-mounted extractors and eject the empty shell out the top of the gun rather than to the side. Two significant features of the Type IV New Model Melior are the grip safety and internal hammer. Very few other imitators of the Walther Model 9 have grip safeties, the only one I can think of being the early variant of the MAB Model B. The Melior grip safety does not pop out unless the hammer is cocked, and so serves as a cocking indicator. I have not disassembled the gun so far as to describe the mechanism precisely, but the grip safety appears to block the sear, whereas the manual safety only blocks the trigger, but together the two safeties should make the gun safe to carry with a round in the chamber. To my knowledge, none of the other Model 9 imitators have an internal hammer. One of the problems with the Walther Model 9 is that, if the gun remains cocked for long periods of time, the striker spring becomes compressed and doesn’t function properly. This problem is obviated by having an internal hammer. The grip plates are made of horn. The left plate is checkered and has a circular blue insert, with MELIOR on top and LIEGE at the bottom surrounding the Robar Company monogram in the center. The right grip plate is also checkered with an annulus in the center, MELIOR on the top, BELGIUM on the bottom, and 6.35 in the center. According to Hogg & Weeks the Robar Company went into receivership and was liquidated in 1958. I do not know exactly how long the New Model Melior pistols were manufactured. Check that the magazine and chamber are both empty. Pull the trigger to uncock the striker. Lift the lever on the dovetailed locking piece and push it out either side of the gun. Draw the slide forward off the frame. *If you can provide photographs, serial number and model information, or any other information about the Melior pistols, please write to me at edbuffaloe@unblinkingeye.com. Firearms Identification, Vol. I, by J. Howard Matthews. Charles C. Thomas, Springfield, IL: 1962.